I recently installed the newest Windows 10 operating system on my laptop. I installed this OS in addition to Windows 7 OS that I already had pre-installed on another drive in the same laptop. However, Win10 after installation removed the dual boot menu that is normally displayed in the bootloader menu, thereby not letting me use Windows 7 at all. In this easy to follow article, I'll show you how to restore the dual-boot menu in under 5 minutes. To be able to restore the boot menu and create a boot menu entry, we'll be using a free program called EasyBCD, a download link to which is mentioned below. This software basically allows you to edit the boot menu entries and lets you boot into anything: Windows, Linux, Mac, & BSD. You'd find a free version as well as a paid version of this software. The paid version will give you advanced features but for this purpose the free version is good enough. 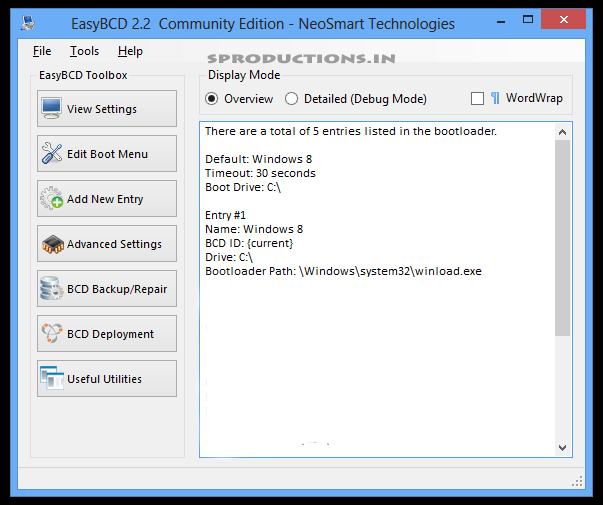 Download, install and open EasyBCD. Click on 'Edit Boot Menu' option to check if only one (01) OS is mentioned. Click on 'Add New Entry' option. Create a new entry by selecting the pre-installed OS on your system. Select the Drive in which the OS was installed. Close the program and Reboot your computer. This time around, your PC would give you an option to choose the operating system you'd like to run. And if you configured it all properly, both operating systems should boot up fine using this method. I hope this article was useful to you, please share it so that others can find it too. Please subscribe to my blog and YouTube channel via the social media circles mentioned below for regular updates and interesting articles like these.